Hot chocolate may be one of my all time favorite drinks. No Swiss Miss for me, thankyouverymuch. I’m talking real, authentic, organic cocoa mixed with a natural sweetener and real milk from grass-fed cows. Of course, that generally means I make my own. But sometimes, like you, I’m willing to pay for convenience. 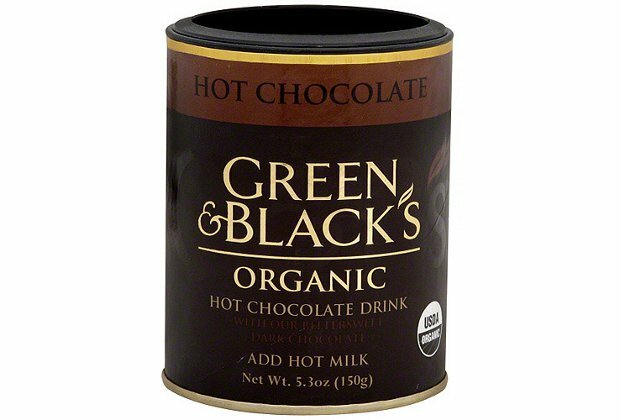 And if you’ve shopped for a quality mix before, you’ve probably picked up today’s yummy culprit: Green & Black’s Organic Hot Chocolate. That’s because it’s available just about everywhere (including Wal-Mart), and it’s certified Fair-Trade and Organic. First, let’s stick with the good news. This product is certified Fair-Trade. That means the third-world producers growing these cocoa beans are getting paid a living wage rather than being exploited. Whenever you buy cocoa or coffee, you’ll want to look for the Fair-Trade certification label. And check out all those organic ingredients! These are GMO-free, and grown according to organic principles without synthetic pesticides, herbicides, or other chemicals. So now for the hard-hitting bit of news. Notice that soy lecithin? It’s not certified organic. And, since roughly 91% of all soybeans planted in the U.S. are genetically-modified, this doesn’t bode well. Chances are, this is GMO-soy lecithin. Of course, there’s a small chance that it isn’t. Perhaps the company claims something about GMO-ingredients on their website! Yes – as all of our products are certified by the Soil Association, this ensures no genetically modified (GM) ingredients are used in their production. But guess what’s on their U.S. website? Nothing. No questions about GMOs, and no answers either. This, dear readers, is industrial food in action. You see, in the U.S., Green & Black’s isn’t certified by the Soil Association, but by the USDA. And did you know that the USDA regulations allow wiggle room for genetically-modified ingredients? According to these rules, a product labeled “organic” must contain at least 95% organic ingredients. If the product is labeled “made with organic ingredients,” it must contain 70% organic ingredients. That means that when you see an “organic” label on a package, there can easily be genetically-modified ingredients inside it so long as they don’t add up to more than 5% of the final product. The only way to completely avoid GMOs is to purchase products that are labeled “100% organic,” or from brands that are part of the Non-GMO Project. I sent an email to Green & Black’s to find out if their U.S. product line contained GMOs, and they haven’t contacted me back. Of course, the best option is to make your own hot cocoa from organic, fair-trade cocoa powder and your natural sweetener of choice. If you want a good store bought brand, I’ve enjoyed Native USA Organic Cocoa Mix before. It’s 100% organic, GMO-free, and sustainably produced. I was afraid of this. This is why we need to support the companies that have gone above and beyond to label their own products as NON-GMO. Triple Like this blog post. Thank you! @Sandy…I agree, as 99% of people do not realize what all CAN be in ‘organic’ and it in itself is not a total fix. I feel the same way about processed organic foods and soy-lecithin always gets me because it’s in just about everything anymore and it’s hardly ever stated as organic. I understand that USDA organic only has to be 70% organic but Whole Foods SWEARS up and down, left and right, that if it has the organic label, it CANNOT contain GMO’S..period. In other words, it can be in the 30% conventional ingredients but it cannot have GMO’s. The USDA Organic website even claims the same thing. Who knows. If GMO’s are so fantastic, why aren’t the products carrying them labeled? It’s all very sad. Gina Konrad I was wrong! Watch out for USDA processed organic food. Portia Unfortunately, I have first hand experience to the contrary. Before Rapunzel switched to GMO-free soy lecithin, they were USDA certified organic but used GM soy. This was a couple years ago, but I remember calling in to their offices and speaking with a very helpful lady who told me this and encouraged me to not give up because they’d be switching to GMO-free soy lecithin soon. I would email again, it once took me three emails and contacts with their facebook page to get a reply to a query but I did get a £10.00 voucher as well – that made up for it a little. Thank you for posting – I’ll try emailing from the UK and let you know what they say. Again, was that spokesperson saying *all* their products worldwide were GMO-free? There’s a lot of ways to interpret her words, particularly if you’re reading between the lines. I still find it suspicious that their UK and CA websites clearly state a GMO-free policy, but their US website doesn’t. I totally agree – when I go shopping I’ll check the ingredients on the UK product and see if it states organic or not. I haven’t actually bought this product but I do buy their cocoa powder and their chocolate. Where is the US product manufactured? Does it state on the container? I’m not surprised to learn of the subterfuge on the part of this Kraft Foods subsidiary, but am pretty freaked out by the collusion of FDA/USDA in weakening US labeling laws. What’s next, “organic GMOs” ? Yes, it’s why the mantra “know your farmer, know your food” still holds true. It’s much better to just get the low-down straight from the source than to trust in labels and third-party certifications that can be watered down. With this topic I go back and forth. I know that Sally Fallon said that if there’s any form of soy to run into occasionally its soy lecithin but, then there’s that big probability of it being GMO, particularly here in the US. There is a local farm store/coop that offers real, raw, cocoa powder. I think it might be intriguing and fun to make my own. YA… you know i have noticed that the grapefruits and lemons and oranges have some bs on them…. I figure that the poisoners have decided we can get too many anitcancer benefits from their peels so they have to adulterate them… It says food grade but how can you trust that… what about GRAS… generally regarded as safe? Nope Nope NOPE! It is so easy to make your own that I don’t see ever buying premade hot cocoa. That said, I don’t think soy lecithin should ever be consumed, whether it’s gmo or not. Green and Blacks is owned by Cadbury…..
Jeri Blair Burker Which is owned by Hersheys, which is owned by Kraft. Not too long ago, Whole Foods admitted they have no way of knowing if GMO products are in the products they carry… I thought it a rather brave statement, because it focused attention on the issue… If GMO is “no different”, then why the resistance to labeling? Esp from our own govt?? Food renegade, can you do a post on how to make cocoa powder? Peg — Do you mean a homemade hot cocoa mix? Or do you mean the actual cocoa powder (i.e. finely ground cocoa beans)? Because if the first, I think that may be worthwhile. If the second, it seems rather straight forward. You can buy cocoa beans and run them through a coffee grinder on it’s finest setting. @Peg Danek – chocolate without sugar is not sweet so there has to be some form of sweetener. That is interesting, Amy. Penzey’s has terrific spices, and I’m glad to know about their hot chocolate mix. Actually, I prefer to make my own, which is similar to yours. That way I can control the ingredients, make it more creamy or less sweet and flavor it different ways, like with vanilla or cinnamon – and it’s so easy! I think you may want to ammend part of the article, as to the best of my knowledge, it is 95% not 90% organic by definition when labeled Organic, but is processed. Single Man’s Kitchen — My bad! Thanks for catching that mistake. I’ve fixed it in the post now. Good looking out. Unprocessed food is definitely the way to go whenever possible. Green and Blacks used to be independent. The original owners now run the Bakery near my Mothers house. Good to know! This is definitely a label that cultivates its organic image so it’s pretty misleading. I was recently informed that even a 100% organic ingredient does not necessitate it being GMO free, that there is no current requirements around that. Is that erroneous information? For a single-ingredient food, if it’s labeled organic it is definitely non-GMO. So, for example, organic corn can not be GMO corn. Organic sugar can not come from GMO sugar beets. The only trick comes when a food has multiple ingredients. Then, depending on the exact wording of the label, the food can possibly contain some amounts of GMOs. Ugh, that is SO frustrating. I try to feed only organic food to my family, and I feel continually tripped up and duped by these inane rules. Thanks for the post. I don’t even like hot chocolate… ha. I’d rather have coffee. It does seem like it’s nearly impossible these days to entirely avoid GMOs and synthetic additives. Especially if you live in a small town and your only choice for grocery shopping is a major supermarket like Ingles. I’ve decided the best way is to grow my own produce and eat only wild meat that my husband hunts in the woods where we live. But what about cheese?!?! I love cheese and it’s so hard to find organic! Maybe one day we will be able to trust our government and the labels that appear on our food…? I just stumbled upon this site through Pinterest and am so happy to discover that I am not the only one who is outraged with the fraud that is our food system, and I refuse to be a victim or allow my children to be victims! I can’t wait to dive in and read more posts! Wow that one flew right past me, I have been eating those candy bars for years and I even bought one yesterday, and even read the ingredients just to make sure nothing changed and I did not notice the word organic was missing before the stated Soy Lecithin. UHG. Just put a disappointing post on their FB page.I also want to thank you for the blog on Hidden MSG in products, I can’t eat hardly anything any more. Now I know why I’ll have symptoms some days when I was sure I had eaten foods that I thought was not tainted with toxic ingredients. @Alex Kombucha I know but I want to control how much sweetener and what kind. I typically only use sucanat/rapadura but I also have a diabetic friend who can only have stevia. I’m making chocolate ice cream from scratch so I’m looking for a good cocoa powder with no sweetener in it. I really LOVE this series you are doing. It’s really fun and informative. Thanks for your hard work! That’s terribly sneaky with the organic labels – and sad that when you think you are buying organic you most likely are not. I have less and less faith in the food system every day. How diseased do we have to get as a nation (and world) before the government gets out of our food? I just called Green & Black and they told me their soy lecthin was not GMO, but it was organic. I’m from the U.S. Hope they were honest in their reply. Well, if it’s organic, then USDA organic labeling rules require that the soy lecithin be listed as organic on the label (at least according to the USDA’s file which I linked to in the post). Since it isn’t listed on the label as “organic soy lecithin”, I’m not inclined to believe that it’s organic. Either they’re breaking the law by mislabeling the ingredients, or the person answering isn’t telling the truth. I don’t think they’re intentionally dishonest, just ignorant. I remember a few years ago when I first realized that most soy lecithin was probably GMO and that it was an ingredient in all my favorite chocolates. I called a couple of different organic chocolate companies, and only one (Rapunzel) had someone answer the phone who really knew what she was talking about. With all the others, I had to be *very* specific in my questions and talk to someone higher up in the company before I could get to truth. In most cases the truth was simple: they couldn’t tell me whether or not the soy lecithin was GMO or not because of how it’s processed. Getting conventionally-raised, non-GMO soy turned into soy lecithin is difficult because almost all non-organic soy is grouped together when sold downstream. No one separates out the non-GMO crops unless they’re a very exclusive producer marketing to a very exclusive manufacturer under a third party certification program like the Non-GMO Project (and note: Green & Black’s isn’t part of that project). The only way to really ensure the soy lecithin is non-GMO is to use organic soy lecithin or a certified GMO-free soy lecithin. I went to their FB page and they responded back quickly with this statement.& Black’s USA Tawnya, thank you for your post. It is important for us to hear from our Fans. All GREEN & BLACK’S products are certified by the CCOF (California Certified Organic Farmers) and comply with the USDA NOP (United States Department of Agriculture – Natural Organic Program) organic standards. This ensures no genetically modified ingredients are used in their production, including the soy lecithin we use in our products. Please let us know if you have further questions! You know what you should see if you can find? Long ago, when I visited a friend in St. Lucia, his family made me a cocoa stick from some cocoa seed they got in “the jungle.” It was basically what this stuff is supposed to be, only ungrated. Pure cocoa, with spices and such from the area. They called what they made with it “cocoa tea” and it was delicious. The stick lasts forever, and you don’t need very much to flavor drinks. It lasted longer than I could keep track of it, actually. At the time (’94 or so) this (and other wonderful natural foods) were sold in the local market. I’d be surprised if it’s impossible to find them online today. Thank you so much for this website and to my hubby for finding it for our gmo-free portland facebook readers. We have a guide for Portland area on our site under the button “gmo-proof your home” and G&B isn’t on it because 1. We don’t trust Kraft and 2. We don’t list industrial food even if they have an organic brand because they are the ones doing the exploitation of organic by degrading the standards while buying up all the companies with hostile takeover techniques. When General Mills bought Cascadian Farms years ago they kept their membership in the Organic Trade Association. The most heinous example to me is fair-trade. To make a fairly traded brand knowing the alternative is actual slaves (see positivefoodinc.com to read about shackled children dying in chocolate farms) and then use unfairly traded cocoa beans also is disgusting! But oddly, Kraft organic brands (which again we don’t buy or list online in our guide) is supporting the GMO-labeling campaign which means they’ve realized the market advantage they would have if they can get pure sources before everyone else after we get a few medical studies and the exodus begins. I don’t support industrial food but it sounds like talking to Kraft about these things would pay off potentially. Another odd thing- their back-to-nature brand supporting labeling also touts the wonderfulness of GMOs online! ?? So weird! Once again it’s just simpler to make your own. I make it right in my mug with organic raw cocoa powder, raw local honey, vanilla, pinches of salt, cinnamon and cayenne. I have been unable to get raw milk for the past year (until last week, yeah!) so I have mixed mine with hot water until thoroughly blended and then add cream and the honey last so it retains as many of its nutrients as possible. My sister-in-law taught me that method and said that’s how they made hot chocolate in Italy when she lived there for a time back in her college days. She used brown sugar and I think the cream was whipped and then put on top of the chocolate but I just pour in liquid cream and honey. I use Equal Exchange hot cocoa mix. They are fair trade, organic, and even better, it’s SOY LECITHIN free!! Green and Blacks is a completely dodgy company – all part of Kraft/Cadbury globalization scheme. If you’re smart, you won’t believe a word they say. They couldn’t care LESS about honesty or what they feed you as long as you give them your moolah. Thank you! I just bought a bar of “organic” white chocolate from Green & Black, and sure enough the only ingredient that doesn’t say “organic” is the soy lecithin. 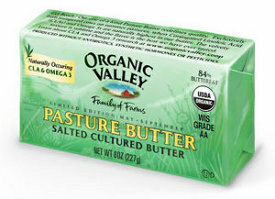 I’d not have caught that because on the front the label has “organic” printed in big letters. Shame on them. Hi there, love your site and info… so helpful! Had a question… I’ve seen sunflower lecithin as an alternative to soy lecithin in a lot of organic products (especially chocolate/chocolate chips), as well as sold in its whole form to be used in bread baking, etc. 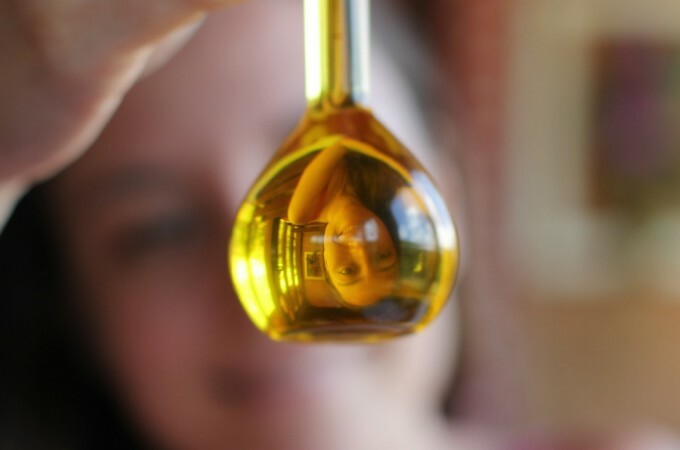 Do you have an opinion of organic sunflower lecithin? Kristen – I do make my own hot cocoa when I’m home. When I’m at the office, I would like to use a mix. The Native USA option you link to is no longer available via Amazon. Do you have any updated suggestions? Thanks!